The Authority, which has its headquarters in Kingston, Jamaica, came into existence on 16 November 1994, upon the entry into force of the 1982 Convention. The UK has a member on the The Legal and Technical Commission. Dr David Billett (National Oceanography Centre, Southampton) was elected on 14 August 2006 for a five-year term of office commencing 1 January 2007. Dr Billett has since been elected for a second 5yr term. Since the establishment of the International Seabed Authority (ISA) under the United Nations Convention on the Law of the Sea, the ISA has the authority to issue mineral exploration licenses on the seafloor that lies beyond national jurisdiction. Known as the Area, initial interest was focused on manganese nodules and crusts. The image below illustrates the location of license block areas within the Clarion-Cipperton in the eastern Pacific Ocean. 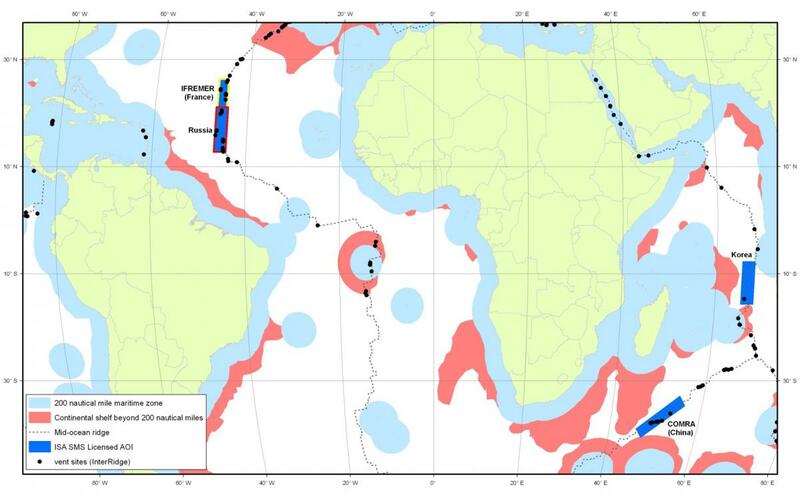 The United Kingdom recently sponsored the exploration license application submitted by UK Seabed Resources Ltd, a subsidary company of Lockheed Martin, for the area seen below outlined in red. 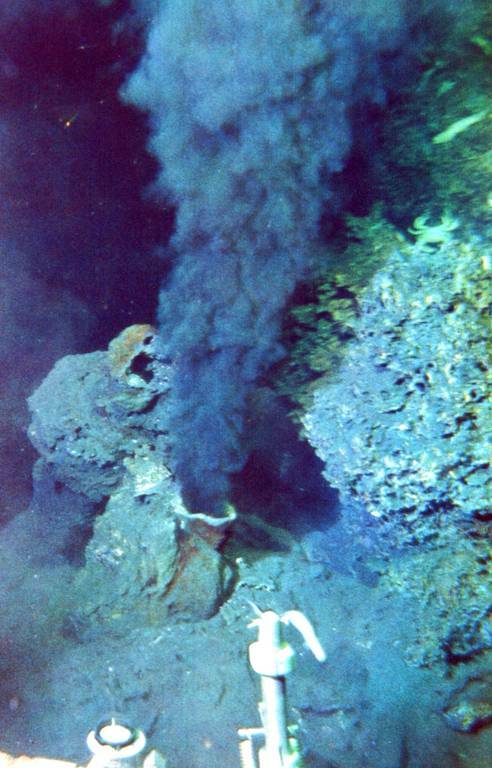 However, recently, the ISA has established a framework for licensing exclusive Seafloor Massive Sulphides (SMS) exploration along sections of mid-ocean ridges. The first of these licenses was granted in 2011 to the China Ocean Mineral Resources Research and Development Association (COMRA), for exploration along the Southwest Indian Ridge and to the Government of the Russian Federation for exploration along the Mid-Atlantic Ridge. 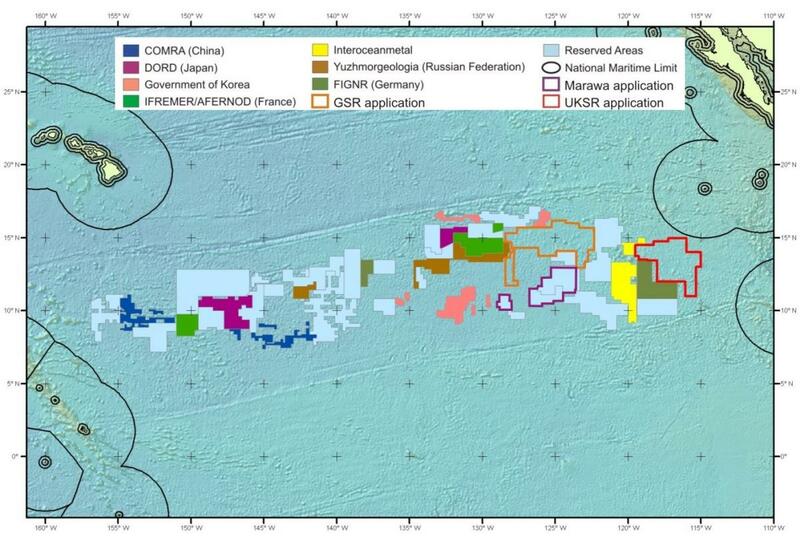 By September 2012, two further licenses had been granted to France (Mid-Atlantic Ridge) and to Korea (Central Indian Ridge). The figure below illustrates the location and extent of the current SMS licensed areas, as well the location of active and inactive hydrothermal vent sites. Two, of the current 12, Technical Studies commissioned by the International Seabed Authority have been produced by the NOC. The first Technical Study commissioned was awarded to the NOC, which focuses on non-living resources on the continental shelf, as was the fifth Technical Study, which focuses on implementation of Article 82 of the Convention, i.e. payments in respect to the exploitation of resources beyond 200 nautical miles. See movie (PC) (MAC) where various data-sets, including license block areas, bathymetry, sea colour, CCD, seismic reflection, core data and photographs have been compiled into a fly-through of the Clarion-Clipperton area.